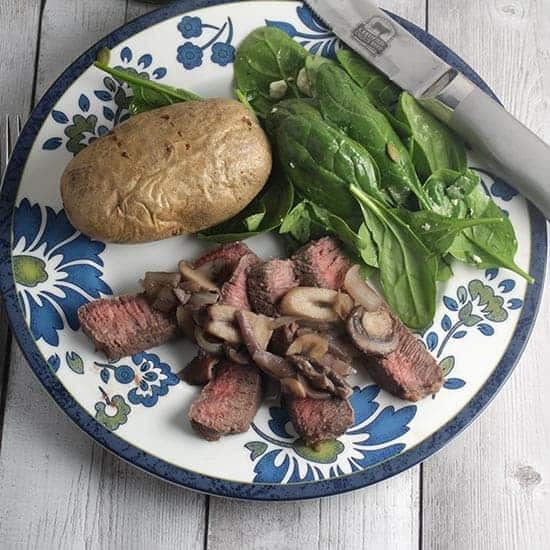 This easy London Broil Steak recipe is quickly roasted just right and topped with savory mushrooms for a delicious steak dinner. We paired our steak with a Châteauneuf-du-Pape wine from M. Chapoutier. Full disclosure: The wine was provided as a complimentary sample by the winery. This month the French Winophiles blogging group is exploring wine from the Rhone. A number of us had the opportunity to enjoy three samples from M. Chapoutier, one of the top producers of Rhone wine. I decided to save the Châteauneuf-du-Pape for last, and to create a recipe to go with it to share today for our Winophiles event. So, what food goes best with Châteauneuf-du-Pape? Pork tenderloin crossed my mind, but then I thought that might get overwhelmed by the wine. Then I saw top loin was on sale at Whole Foods, marketed as London broil. I decided to make London broil steak with mushroom sauce to go with our Châteauneuf-du-Pape. Stay tuned for details on the pairing, which follow a few notes about our London broil steak recipe. Before I leave the topic of what food to serve with Châteauneuf-du-Pape, many articles I checked out in planning for this pairing noted the Syrah in Châteauneuf-du-Pape makes it work with spicier foods. Lamb tagine is one idea that caught my eye, which I am definitely going to have to try! Beef pairings for Châteauneuf-du-Pape such as this Chanterelle Beef Stew recipe I made previously, have worked well. So I had a good feeling about our London broil steak! First, what is London broil steak, anyway? It refers to a preparation as opposed to a cut of steak. Top loin steak is typically the cut used for London broil, and that’s the way I rolled. At Whole Foods they list this cut as London broil / top loin, I think that is fairly typical. Why is it called London broil? I haven’t really figured that out, but don’t go looking for London broil in London. It’s a name that got cooked up here in America at some point. What you do need to know about London broil / top loin is that it is a lean, relatively inexpensive cut of meat. While a marinade is a typical strategy for producing tender meat from this cut, my reading suggested the acidity from many marinades can be offputting with this cut. So I decided I would make rub for our London broil steak, with a generous amount of salt to tenderize the meat. After letting the steak sit in the rub at room temperature for a half an hour, it gets quickly pan seared on the stove top prior to roasting in the oven. Mind you, this is a quick roast in the oven! You don’t want to overcook lean London broil steak or it will be dry and tough. Check at 12 minutes or even a bit sooner for medium rare. 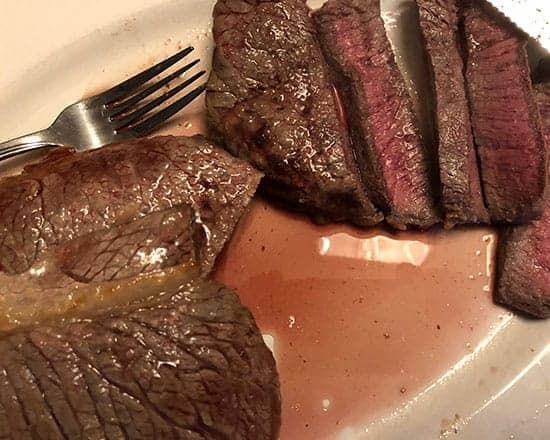 Our London broil steak came out just right, medium rare, and very tender. Our 12 year old who does not go for mushrooms said it was great without the sauce, but we grownups thought the sauce made a great addition to the meal…speaking of great addition to the meal, how about that wine?!? 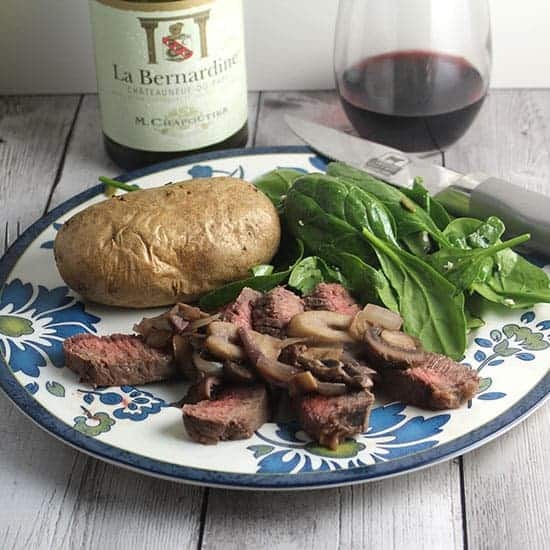 So as noted, we had a bottle of 2015 Châteauneuf-du-Pape “La Bernardine” Rouge ($60, 14.5% ABV) to open to pair with our London Broil Steak. I get scent of forest floor on the nose with a touch of menthol. I noted the thickness of the wine when first tasting it, with big blackberry fruit. Definitely a young wine with some potential to age. The Châteauneuf-du-Pape opened nicely after some brief decanting while finishing making our London broil steak. As suspected, this big, fruit forward red wine was a very good pairing for the steak. Some of the more subtle aspects of the wine started to show as we ate, notes of roasted coffee, spice and licorice along with the fruit. Those more complex taste elements worked nicely with the mushroom. I definitely give this pairing a solid A! Châteauneuf-du-Pape is an appellation that allows up to 13 grape varieties in the red wine blends, with several of those being white wine grapes. I’ve had some CDP that use all the allowable grapes, and that is interesting. But M. Chapoutier goes in a different direction, using just one to three of the allowable grapes in La Bernardine in order to allow for true expression of the terroir to come through in the wine. The 2015 La Bernardine is comprised of 90% Grenache and 10% Syrah. 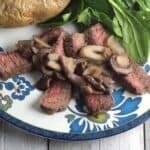 This easy London broil steak recipe is quickly roasted just right and topped with savory mushrooms for a delicious and affordable steak dinner. Combine the salt and garlic powder in a bowl to make the rub. Place the steak on a work surface, and sprinkle the rub generously to cover one side of the steak. Rub the salt / garlic mixture on the steak. Turn the steak over, and add repeat the process to coat the second side with the rub. Let the steak sit at room temperature for 30 minutes to absorb the rub. You can start making the mushroom sauce about 15 minutes after preparing the steak rub. Heat the olive oil in sauce pan on medium. Add the onions, cook until they begin to soften, about 5 minutes. Add the wine to the mushrooms, along with the thyme and rosemary. Simmer for about 5 minutes, stirring occasionally until most of the wine has been absorbed. Stir in the butter, and let it melt to finish the sauce. Keep the mushroom sauce warm while you cook the steak. Coat an oven proof skillet with oil spray and heat on medium high. When the pan is hot, add the steak. Cook for one minute to brown the meat, then turn the steak and cook for one more minute. Move the skillet to the oven, and roast for 12 to 15 minutes for medium rare. Check for doneness at 12 minutes, taking care not to overcook the steak. When the steak is done, let it rest for a few minutes on a platter. Slice crosswise, on a thin diagonal cut. To serve, plate several strips of the steak, topped by the mushroom sauce. Enjoy with a big red wine! London broil is the name of the preparation, not the cut of steak. Some stores will market it as London broil, but you can simply by the top round steak if they don’t use the London broil name. London broil is a lean cut of steak best served medium rare. Overcooking can lead to a tough steak. You are likely to wind up with some extra mushrooms, which can be used over potatoes as a side dish or for another meal. Check out these other posts from The French #Winophiles on the wines of the Rhône Valley and Michel Chapoutier, and join us Saturday morning, March 17 at 11 a.m. ET on Twitter. Just use #Winophiles – it’s really fun! As I mentioned, we had three bottles from M. Chapoutier to sample. 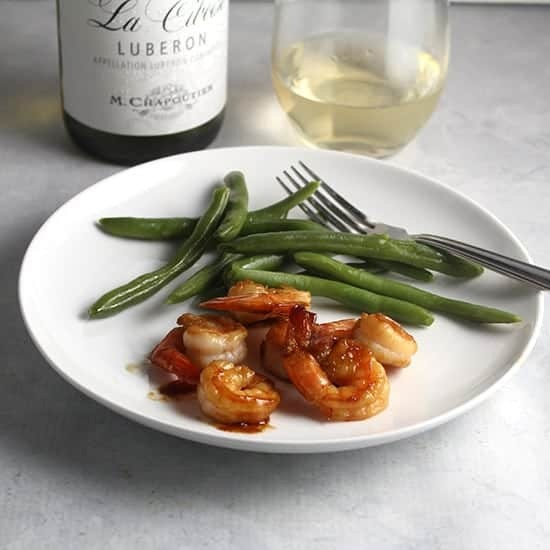 We enjoyed the 2016 Luberon “La Ciboise” Blanc ($16, 13% ABV) with our Easy Sautéed Shrimp. 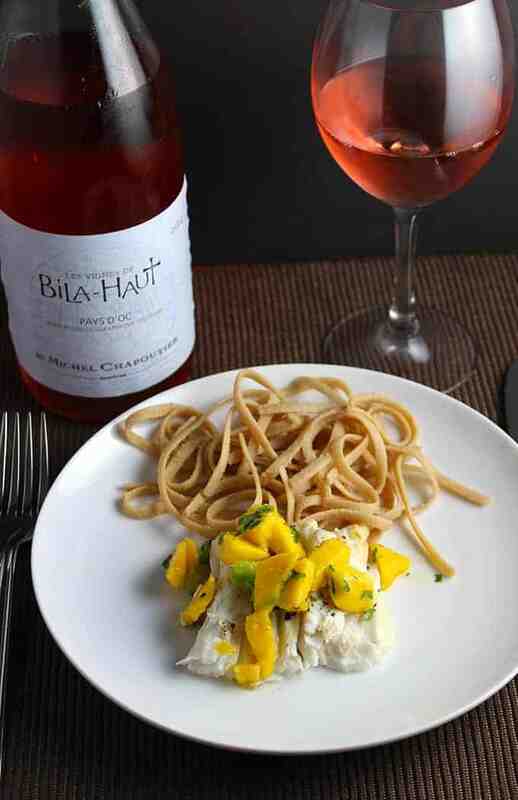 Not officially part of this event, but we have also enjoyed Bila-Haut rosé with Grilled Halibut and Mango Salsa. Maybe pin this to save for grilling season? 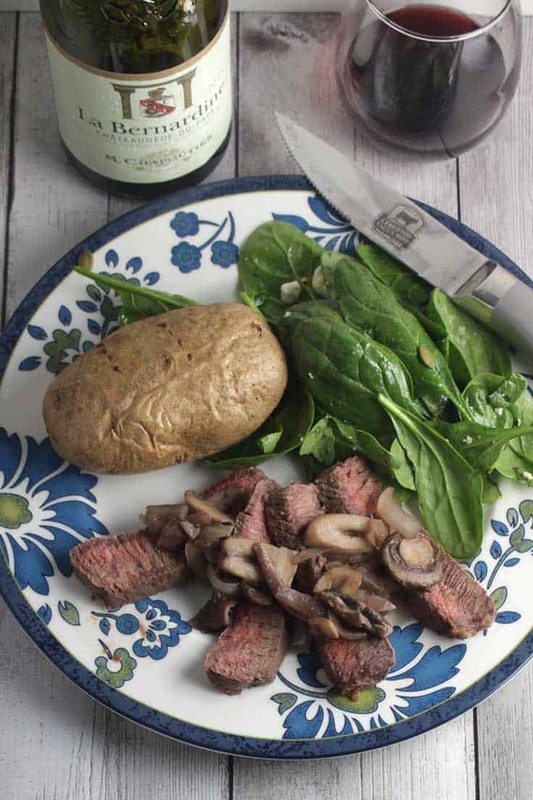 London Broil with mushrooms looks like a great partner for that Chateauneuf-du-Pape! I’d have to agree, thanks Jeff! Love the throw-back recipe, David – I think you inspired me! 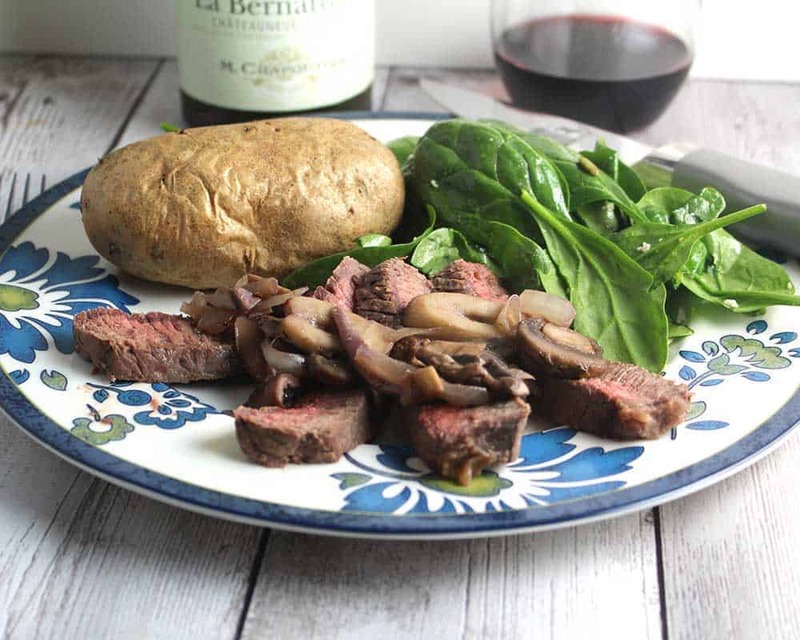 And great pairing – still have some Les Meysonniers left, might try London broil with it tomorrow night! That sounds like a good option, Liz! Throwback is a good word for the London broil, I recall it being a fav of my grandfather’s. Your London Broil recipe looks David. I’m going to have to try it. Thanks for sharing! Thanks Martin, hope you like it! Perfect pairing David! A wine as full bodied as the CDP needs the fat of the steak. I bet it was a delicious meal! Thanks Michelle, we were quite pleased with the pairing! This looks like such a beautiful and simple pairing! Smart to keep the mushroom sauce on the side for picky eaters–hopefully they’ll come around soon. (But I remember wanting to keep everything separate as a kid myself.) The shrimp likewise look very delicious. Thanks Nicole. Our guy is gradually warming up to more interesting flavors. The fact that he loves chicken curry now is definitely a good sign! Great pairings, all! I haven’t made London broil in a long time, but now I’m tempted to try it, using your recipe. I am surprised that London Broil is so ‘doable’ – maybe it was the name that threw me off, but I’d imagined something slow and complex. The meal looks fantastic and the wine is a suitable partner. I’m really interested in tasting this together. David, I have to say that the way you present recipes on Cooking Chat is beautiful and clear – I love the look as well as the at-your-fingertips readiness. Well done! Thanks for the nice feedback about the recipes, Jill. Cheers! Im going to have try your London Broil. All the pics look fantastic. Enjoyed reading. Thanks Rupal, it’s pretty easy!